Are you uncomfortable with the shade of your teeth? Many factors – such as coffee, red wine, soda, cigarettes, and even smokeless tobacco – can cause tooth discoloration. Dr. Fasano’s Virginia Beach dental office provides excellent tooth-whitening methods that will make your smile look brighter and whiter. When you come for your appointment and consultation, you’ll learn about all of the options available to you. Please contact our office today or request an appointment online. One technique we recommend is the Zoom Teeth Whitening treatment, an in-office procedure that includes a bleaching process that lightens tooth color. It is safe and effective and takes less than an hour to apply. 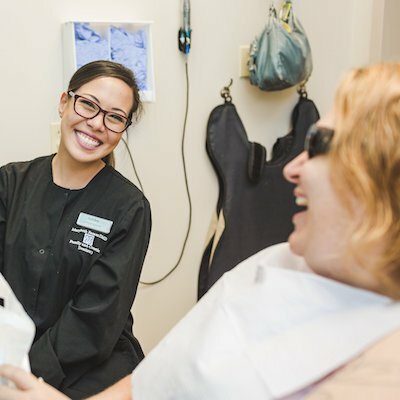 When you meet with Dr. Fasano, she will examine your teeth and consult with you on the proper treatment according to your teeth’s current shade and sensitivity, to determine if Zoom is the right procedure for you. The Zoom WhiteSpeed treatment uses a special LED light to help achieve a brighter smile. After a short preparation, Dr. Fasano will apply 3-4 whitening sessions with Zoom that last fifteen minutes each. You may see results almost immediately, and with proper care the whitening can last a long time. Dr. Fasano will provide instructions for after care in order to keep your smile looking bright and healthy.